Ding Dong Valentines Chocolate Hearts are delicious, fun and festive Valentine’s Day treat! If you are a food blogger, as soon as the calendar turns to February, everything is clear – it’s time for Valentine’s day dessert! I have to admit that, in recent years, for me, sometimes it was a real nightmare! Usually, in days like that, you get hundreds of beautiful Valentine’s recipes! In the blink of an eye, my bookmark is full of sweet little things that complicate my life for days! Preheat the oven to 330 F. Spray with cooking spray 9-inch round cake pan (or square 8×8 inch pan), line with parchment paper, and spray the paper with cooking spray and set aside. Place chopped chocolate in a small bowl and pour brewed coffee over the chocolate and whisk to combine until the chocolate is melted. Set aside. In a large bowl, sift together dry ingredients: sugar, flour, cocoa powder, baking powder, baking soda and salt and set aside. In a large bowl beat eggs with an electric mixer, until pale yellow, than add oil, buttermilk, vanilla and chocolate-coffee mixture. Continue beating to combine well. Add dry mixture into wet mixture and beat until evenly combined but don’t over-mix it. Spread batter in prepared pan and bake for 30-35 minutes or until a toothpick inserted in the center comes out (almost) clean. Cool cake in the pans 5-10mins and transfer it on the wire racks to cool completely. Using heart shaped cookie cutter, carefully cut hearts of the cake (I cut 8 hearts-number depends on size of your cookie cutter). Place hearts upside on a large baking sheet lined with parchment paper. Using a cupcake corer (or a sharp knife) carefully cut out a cone of cake from each heart. Combine all ingredients in a metal bowl set over a saucepan of simmering water and beat with a handheld electric mixer at high speed until frosting is thick and fluffy(6 to 7 minutes). Remove bowl from heat and continue beating until slightly cooled. In a small saucepan heat heavy cream over medium high heat, bring to a boil. Place chopped semisweet chocolate in heatproof bowl and pour the boiling cream over, leave it for 5 minutes, then stir until its smooth. Carefully pipe a small amount of 7 minutes frosting in each heart. Notes: you will have a lot of frosting leftover, actually it’s enough to fill double measure of the cake!!! Return cakes to the refrigerator until the ganache is completely hardened. 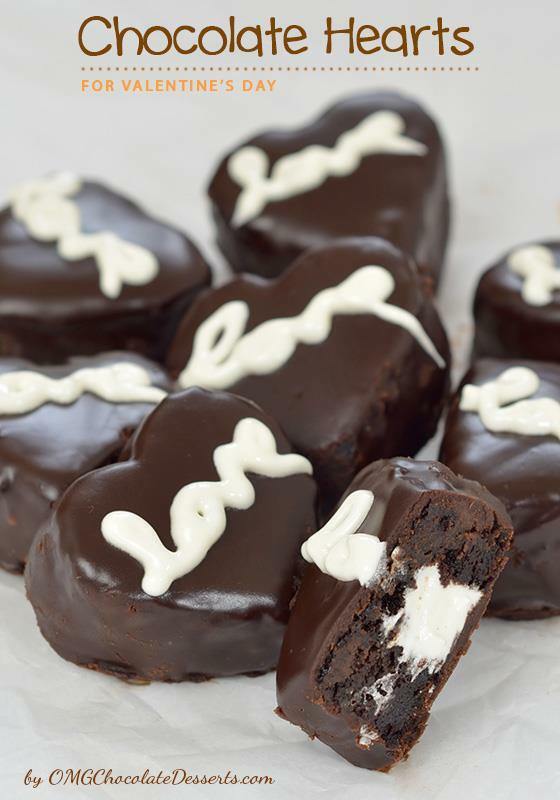 Transfer about 1 TBSP of 7 minute frosting in a small bag and cut the corner, pipe “LOVE” swirl on each cooled heart. 0 Response to "Ding Dong Valentines Chocolate Hearts"